Right now, my daughter is in the "sponge" stage, which means she has a wonderful thirst for learning! It seems that she is constantly trying to take in absolutely everything around her and it's amazing at times just how fast she picks new things up. 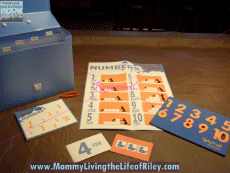 As a parent, I want to do all that's possible to facilitate her learning, so I was thrilled to have the chance to review an award-winning educational kit called Teach My Toddler. 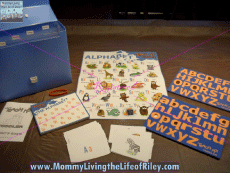 Teach My Toddler is an all-in-one resource designed to teach the alphabet, colors, shapes and numbers. Keep reading to find out how it works and whether or not my star pupil cared for it! 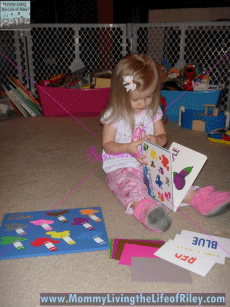 I reviewed the Teach My Toddler Educational Kit from Teach My Inc., which retails for $49.99. The learning materials were all of the highest quality and only addressed the unit at hand. 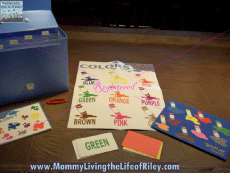 For instance, with the colors unit, the board book contained large, colorful pictures and words inside, but didn't confuse the toddler with additional images or colors that weren't relevant. I thought this was key and would definitely make things easier for Riley when trying to demonstrate to her which color was which. Both the flash cards and full-color poster were large and easy to read too. 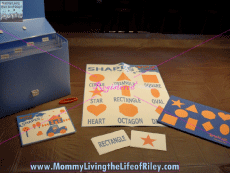 I liked how the same information is presented to your toddler using different media. I felt that this would help to connect the material together so that the child would start to learn the units through simple repetition. Using different ways to present the material though, would ensure that your child's very short attention span could still be captured. You may be wondering how this learning material is supposed to be presented to your toddler. Well, the point here is to have educational play with your child and to use these materials for no more than 20 minutes per day. Try and stay on the same unit everyday for at least a week before moving on to a new unit. Make the Teach My Toddler kit become part of your daily routine and something that your child will expect and look forward to. Of course, always use plenty of praise and definitely follow your child's lead. If they don't seem to be enthused with the kit that day, try switching them to a different activity or even put the kit away for the time being. Toddlers have a very short attention span, so don't be discouraged if at times they are not as interested as you'd hoped they would be. Riley and I have been working on our colors unit, since she's pretty good with her numbers and alphabet and I wanted to start with something that would be more challenging for her. Many days she will lose interest after only about 10 minutes, but I do my best to be excited about playing with her using the Teach My Toddler kit and found that most times she will follow my lead. 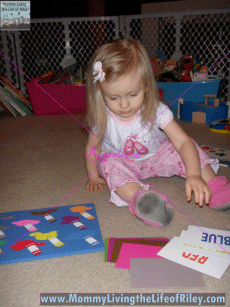 We usually start off with the foam puzzle first, then move on to the poster, followed by the flashcards and then when things start winding down, we finish up with the board book. 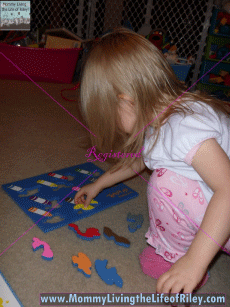 I've noticed that Riley's knowledge of her colors has increased and she seems to enjoy the Teach My Toddler set. I only have one criticism of the foam puzzles. They seem to frustrate Riley for the puzzle's pieces are rather small and detailed for a toddler. Sometimes even I have a little bit of trouble getting the pieces back into the puzzle board and I wish that these would have been designed to be a little more easy to do. If there is a bright-eyed and bushy-tailed toddler on your Christmas list this year, then I think you could stimulate their little minds and definitely give the gift of learning with the Teach My Toddler kit. Capitalize on their "sponge" stage and help them build a wealth of knowledge this holiday season! 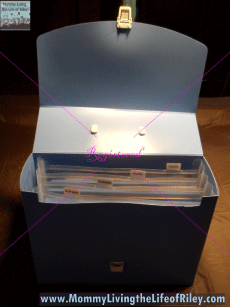 Disclosure: I received the Teach My Toddler Educational Kit from Teach My Inc. in order to facilitate my review. No other compensation was received. This product review is based on my own personal experiences with this item and is completely honest and objective.